Peel Thunder kept their finals hopes alive on Saturday with a 25 point win against East Perth at Bendigo Bank Stadium. Despite cold and rainy conditions throughout the match, the Thunder stayed in front for the majority of the match to win 14.8 (92) to East Perth’s 10.7 (67). The victory over East Perth saw Peel’s percentage rise from 81.4 per cent to 84.2 per cent, allowing the Thunder to move from eighth to fifth place on the ladder. Peel’s Bradley McGowan, who scored a goal in the second quarter, said he was proud of his teams win. “It was a great win for us today, it keeps our season alive,” he said. Despite trailing by 15 points at quarter time, the Thunder fought back as the match progressed. McGowan said East Perth played well during the match. “They’re a tough team, they’ve got a lot of Eagles players playing for them,” he said. McGowan went on to say he was proud of his team for turning the game around during the second term, converting seven goals, three of them within the first three minutes while keeping East Perth goalless. “Yeah we had to get on top of them because of the breeze, it was a five goal breeze,” he said. McGowan praised the efforts of fellow Peel goal scorers Blair Bell, Traye Bennell and Jordan Boullineau and the depth of the playing list. “It’s the great thing with our club, we’ve got a spread of players who kick goals, Tray and Jordan from the backline which is good and Belly up the front which is always a good target,” he said. 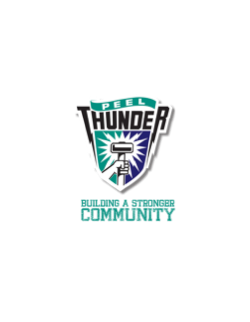 Peel Thunder have a bye during round 19 before facing Claremont at Leederville Oval on Saturday, August 18.